The Enshrink is a heat shrinking system using infrared technology. 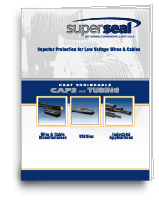 The heating chamber coil design allows workers to efficiently heat Super Seal end caps on wire and cable. This ideal end cap shrinking method can be applied to various cable diameters (ranging from 0.18" diameter up to 6.0" diameter) more efficiently than a typical flame torch.